buttery lemon shortbread bars. raspberry almond rugelach bars. truffle brownies. almond + olive oil baked donuts with strawberry glaze. donut muffins with cinnamon sugar. almond cardamom poundcake with raspberries. chocolate banana applesauce cake. chocolate cupcakes with fresh strawberry buttercream frosting. pink lemonade buttercream frosting. red velvet cupcakes with cream cheese frosting. triple chocolate cupcakes. gluten free salted chocolate chip cookies. chocolate pot de creme. cherry vanilla pie with a whole wheat crust. gluten free, dairy free, refined sugar free chocolate peanut butter pie. Valentine's Day should always be filled with all things pink, red, homemade and/or CHOCOLATY! Because that's how it's always been and if it's not broken, why fix it? Hehehe, my husband hates when I say that. In honor of the love-filled holiday coming up, I've put together a collection of 15 pink, red, homemade and/or chocolaty dessert recipes sure to make your loved ones feel extra special. 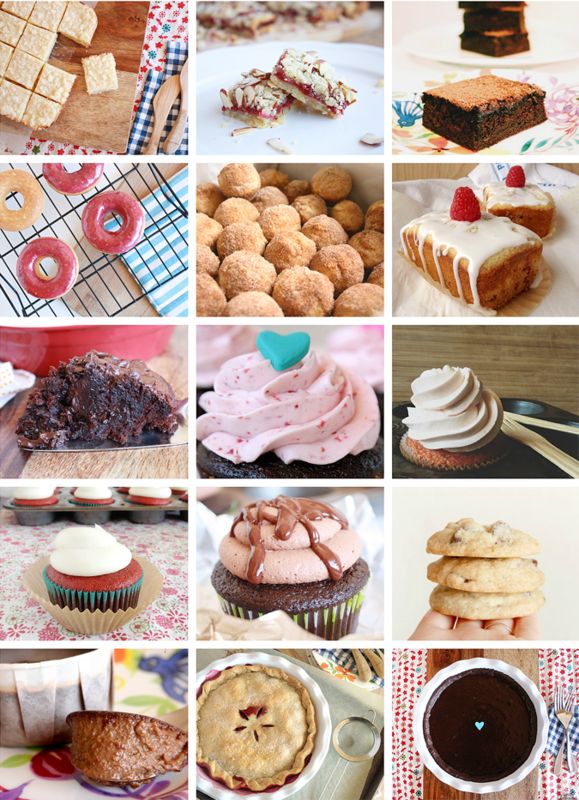 My stomach is growling...I must bake these! These all look so amazing I have no idea which ones to even click on!